After successfully making Juliette and Antique as a band well known in world music Indonesia, fast food franchises 'Kentucky Fried Chicken (KFC)' Music Hip List, release its new band, Bonus. This group digawangi Bimo Sulaksono (drums), Willy (guitar), Epoy (bass), and anda Wardhana (vocal). Fourth is not a new person in the world music Indonesia. Band is a brand new Ambassador KFC has taken a unique name in a spontaneous when they gather after the exercise. "The only mind by our time is a nice bonus can be a bonus for all people. Being a gift of good and wait. So, can bring happiness to anyone," said Bimo, told the Planet Hollywood, South Jakarta, on Tuesday (5/8/2008). 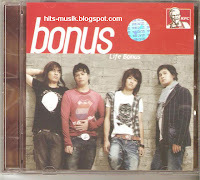 Not only release music group alone, KFC also launching a new album Bonus entitled Life Bonus. "This album tries to give a new color that is more creative in his songs. Over easy, and more 'ngebeat' of the 12 songs in it. At that anyone hear songs on this album will feel a different atmosphere in each of his songs, "Said Bimo. At the moment, KFC also give awards' Double Platinum 'and' Platinum Album 'to the band, Juliette and the Antique. This is because the sales of two albums the band behavior hard the last few months. Both reach Double Platinum inasmuch successfully sell more than 150 thousand pieces in the 350 at KFC outlets throughout Indonesia. Platinum album given the band because both have total sales to reach more than 75 thousand pieces.